Labels provide quick and easy way to organize Gmail email messages based of specific criterion. For example: you can label messages related to your work as ‘Job’, while email messages from friends can be labelled as ‘personal’. You can create multiple Gmail Labels and assign more than one label to specific email message. 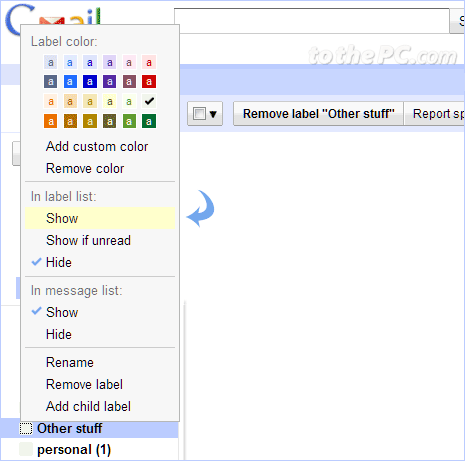 You can further control visibility of labels by customizing hide and show properties of each label in Gmail inbox. 1. Goto your Gmail inbox and click on either Label displayed on left sidebar. If you do not see any Label, click More button to view them. If you have not created any new Label in Gmail, you can easily get started with process to create new Labels in Gmail and using them to organize your email messages. 2. When you click on specific Label, you should see pop menu with lot of options. You can click to check show or hide options for labels in the message and label list of your Gmail inbox. You can also access other options of child labels and adding color to label. While above procedure is for editing hide or show status of specific label one by one. 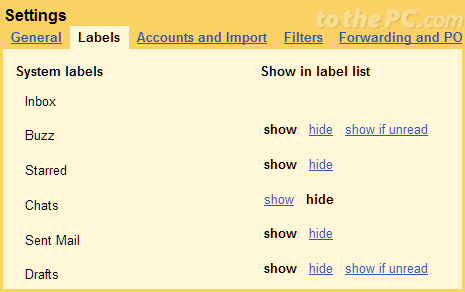 You can edit show / hide properties for all labels in one glace from Labels tab on Gmail settings webpage. 1. Click Options icon at top right and then click Mail Settings option. 2. Then click Labels tab for checking out options to hide or show labels. You can also directly open Labels webpage for quick editing of show / hide properties of labels in Gmail.